Today was my last day on the boat, from my two weeks volunteering with Sea Life Surveys. I've had a brilliant time and would like to say a big thank you to Ewan, Jimbo, Popz and the SLS staff for giving me the opportunity, but for also making me one of the team. It was a 7 hour trip today, headed out in fair weather with a bit of a breeze. Harbour Porpoise, Manx Shearwater, Gannet, Fulmar, Kittiwake, Common Gull, Guillemot, Razorbill, Puffin, Shag and Great Black Backed Gull were seen as we left the sound and headed for the 'middle ground'. Towards the Cairns I picked up a distant immature Minke, proving to be extremely difficult to see. After a few distant views the whale deep dived, and reappeared right on the stern of the boat! Associating with the boat this young whale provide absolutely stunning views four or five times. The best I've seen in my two weeks here. Approaching the Cairns I picked up a single Storm Petrel feeding, then a Basking Shark was spotted, then another, then another, then another, on first arrival we counted 13 in the vicinity of the boat although travelling through and around the Cairns there was at least 25 in the area. 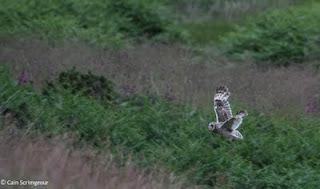 Something unbelievable to see, one of the best wildlife spectacles I've seen to date. A quick lunch and we were off South as Killer Whales had been reported off Staffa, that would of been the cherry on top of the cake, but unfortunately visibility turned poor and we weren't successful in picking them up, although we did have another extremely good view of an adult Minke Whale, and a great show from a Great Skua and some Kittiwakes. A brilliant trip to end my time with SLF. I'll definitely be back. After clearing up, myself and Ewan headed for the chippy, fed ourselves and the Herring Gulls then headed off. For some reason Ewan thought that I hadn't seen enough in my two week stay, so we were soon heading to South Mull in search of Short-Eared Owl and Hen Harrier, I wasn't complaining. 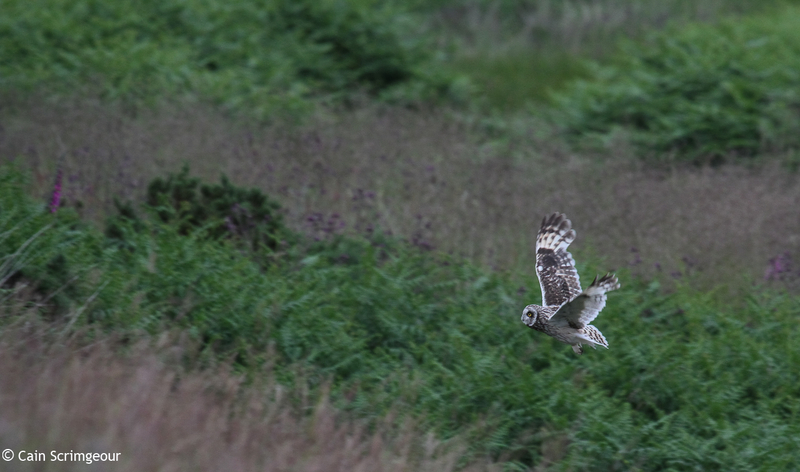 We found both, 5 Short-Eared Owls, 2 of which were interacting and a pair of Hen Harrier, just missing a distant food pass by seconds. Tomorrow I head back to the mainland, spending a day at Loch Garten, before driving over to the Loch of Strathbeg to begin my two week RSPB residential, should be another brilliant two weeks. But before I head off myself and Ewan are booked on the Loch Na Keal White-Tailed Eagle trip, hopefully it will produce some good images, it will be a brilliant experience either way. Brilliant opportunities, wish they'd been available when I was younger!